Bangkok guided tours take small groups of visitors on guided tours in Bangkok and the surrounding provinces. These tours can be by bicycle, boat, walking tours or a combination of two or more means. Though this web site is designed for the independent travellers who want to see Bangkok on their own, there may be some visitors who feel more comfortable taking a guided tour. For logistics reasons it may be more practical in some instances. We have received a few enquires about guided tours and would like to cater to the needs of these visitors. However, we will continue to provide travel information for the independent traveller or those who wish to see places on their own. The Bangkok guided tours short-listed here are divided into the following categories. The first tour on our menu is the private guided day tour which gives visitors a chance to choose their itinerary in Bangkok and the surroundings provinces. The tour comes with a guide and allows up to a group of six. I have always maintained that it’s easier to appreciate Thai food than to produce it. However, a number of friends and visitors have asked about these classes. So here it is. The Chao Phraya River is beautiful at night with temples, monuments and buildings all lit up. What better way to top the evening than a dinner cruise that takes you past these sights. Bangkok guided tours by bicycle are popular with visitors who want to see a different side of the city. 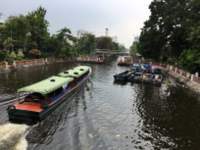 This tour starts from narrow street markets of Chinatown and then crosses the Chao Phraya by long-tail boat to the less urbanized side of Bangkok in Thonburi. Cross the Chao Phraya via the King Rama VIII Bridge and visit the old communities in Bangkok Noi, past museums, old churches and temples. An interesting variety of places covered here; M R Kukrit Pramoj’s Heritage Home, then it’s across the river to Phra Pradaeng, "Bangkok’s Green Lung", and then back to visit a small community in Yannawa. Bang Krajao is in Phra Pradaeng the narrow tongue of land formed by the sharp meander in the Chao Phraya that’s filled lush greenery. Visit the Bang Namphueng floating market at the weekends. Visit Bangkok Noi, the older side of Bangkok, on the west bank of the Chao Phraya, Wat Sri Sudaram where Sunthorn Phu the famous Thai poet attended the temple school and Ban Bu community that makes the famous Thai Bronzeware. Get to taste Thai street food in Charoen Krung Road, the oldest road in Bangkok, in the Bangrak district and along the way tour some of the old temples as well. Visit Wat Traimit the Temple of the Golden Buddha which still holds the world record for the biggest Buddha image, then it’s on to the Saphan Phut (Memorial Bridge) night market, Paknam Talad flower market and sample street food along the way. This tour concentrates more on food and other delicacies along food alleys for which Chinatown is famous, rather than on other street markets. 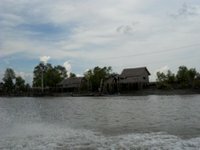 Ko Kred (Kred Island) is an island in the Chao Phraya River in Nonthaburi province just north of Bangkok. It is home to the old Mon community who has lived in Thailand for centuries. The Mon are famous for their pottery. Muang Boran is an outdoor museum in Samut Prakarn south of Bangkok covering 96 hectares or 240 acres in the shape of the map of Thailand with scaled models or replicas of ancient city ruins and historical monuments from various parts of Thailand. Tour the Bangkok Corrections Museum, which used to be a maximum security prison in the last century. The museum preserves gruesome aspects of Thai prison history and the brutal prison life before reforms were made to the penal system. To calm your troubled soul after this mind-numbing experience, you will be taken on a tour of three temples. 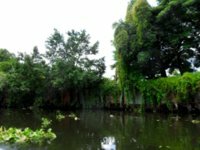 For those who are more adventurous and prefer self-guided tours to the outskirts of Bangkok, here are three recommended tours to Bangkok's hidden treasures..
Have fun and enjoy your Bangkok tours. If you wish to find out more about some of the places mentioned in this article, here is the list of references.